Can’t decide on what to eat? That’s where buffets come in. 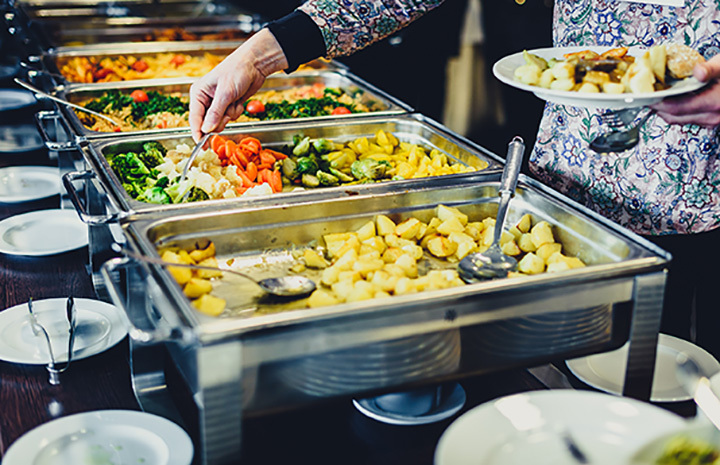 The dozens of dishes combined with the opportunity to eat as much as you’d like for a reasonable price makes buffets a no-fail option. From Japanese to Italian, here are the best buffets in Colorado. You don’t have to go half way around the world to experience the best of Nepalese food, the Momo and Dal Bhat here will transport you there with one taste. The all-you-can-eat lunch buffet is a generous selection of the restaurant’s specialty dishes. Chicken curry, Tandoori chicken, fried pakora, rice pudding and, of course, a variety of rice dishes are just a few of the choices. Some gluten free and vegan options available. Every dish is made-from-scratch from original family recipes. Bring your chopsticks to this lunchtime all-you-can-eat sushi, nigiri and maki bar and indulge in a selection of tuna, red snapper, fresh water eel, shrimp, octopus, salmon roe and bean curd. If you don’t fill up on sushi, take a spin past the buffet bar that’s stocked with crab legs, shrimp, clams, mussels, oysters and a wide-range of seafood. Carry-out buffet for those who want to eat at home. There must be something in the high altitude air that engenders a desire for food native to the Himalayas. This all-you-can-eat lunch buffet hits all the Nepalese highlights—chicken tandoori and tikka masala, naan, gulab jamun and traditional favorites like momo, pakora and thukpa all in various flavors. You don’t have to go to the top of the world to get a taste of this food anymore. Voted the best Sunday brunch by Scene Magazine, this all-you-can-eat meal is chockfull of breakfast favorites. The chef keeps the buffet fresh by changing things up weekly, but there’s standard fare that keeps diners coming in—goat cheese grits, biscuits with jalapeño gravy, French toast sticks, beer cheese soup, pork and green chile eggs and for a little sweetness a dessert bar. Don’t forget a libation … mimosas by the pitcher and a bloody Mary bar. Saturdays and Sundays are days for sleeping in and eating out. Go here. This all-you-can-eat breakfast buffet is egg-ceptional. Fare also includes biscuits and gravy, enchilada or cowboy casserole, pancakes and waffles and an enormous platter of fresh fruit. Do not leave without trying the bread pudding or stashing a few of the homemade chocolate chip cookies away for later in the day. If you’re hankering for some Italian at lunch this weekly buffet hits the highlights. Fill up on hand-tossed pizzas with a variety of toppings, fresh salads and homemade dressings, garlic knots and two types of Strombili, a mouthwatering rolled pizza dough sandwich filled with cheeses, cold cuts and fresh veggies. Say Prego! for this all-you-can-eat meal. Out of the hickory pit smoker here comes some amazing, finger-licking good ribs, brisket, sausage and pork, all of which is on the weekly all-you-can-eat lunch buffet. There are plenty of sides to go with, like coleslaw, baked beans, mac ’n cheese, as well as corn bread and corn fritters. The family who’s owned the Grill for more that 25 years has perfected five homemade sauces. Be sure to try them all. Tex-Mex in Colorado? Absolutely. This all-you-can-eat lunch buffet is a smorgasbord of spicy specialties. Tacos, tamales, chimichangas, burritos and quesadillas are standard dishes, plus with every buffet meal diners get two enchiladas, a drink and dessert. Only available Thursday through Sunday. Good food that brings you back again and again. This lodge-inspired restaurant is a great place to come to after a day of fishing or hiking or … for a Sunday breakfast buffet. It’s overflowing with delicious morning fare. You’ll find several versions of scrambled eggs, poached eggs and Hollandaise sauce, as well as country potatoes, biscuits and sausage gravy, ham, bacon, plus pastries, and, some refreshing fruit. If that doesn’t fill you up, you can get made-to-order pancakes, waffles and omelets as well. Every day is a buffet day here for lunch. It’s the quintessential Chinese buffet with potstickers, egg rolls, won ton, hot and sour soup and a variety of piping hot entrees. Classic pork, beef, chicken and seafood dishes range from mild to hot. You’ll find sushi on Wednesdays and Thursdays. A great place to try a little bit of everything.